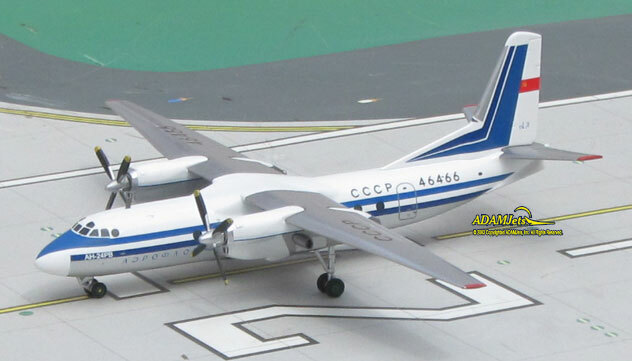 HERPA Models: one limited edition collectable, die-cast metal airliner model in a 1/200th scale of an Antonov AN-24RV in the Aeroflot Soviet Airlines Old 1970s Colors Scheme. Airframe Registration CCCP-46466. This model is constructed of die-cast metal with some plastic parts. This product is available beginning in March 2018. HERPA Models: one limited edition collectible, die cast metal airliner model, in a 1/400th scale of a Tupolev TU-144D in the Aeroflot Soviet Airlines Old 1970’s Delivery Colors Scheme. In the early 1980s this specific TU-144D, designated aircraft 101. Established 14 world altitude and speed records. Airframe Registration CCCP-77114. The model is constructed of metal with some plastic parts. This product was released in August, 2018. Phoenix Models: one limited edition collectable, die-cast airliner models in a 1/400th scale of an Airbus A330-223 in the Aerolineas Argentinas NEW Colors. Airframe Registrations LV-FNI. This model is constructed of die-cast metal with some plastic parts. This product is available beginning in May, 2014. Phoenix Models: one limited edition, collectible die cast airliner model in 1/400 scale of an Airbus A340-313 in the Aerolineas Argentinas Current Color Scheme. Airframe Registrations LV-CSE. The model is constructed of die-cast metal with some plastic parts. This product was released in July, 2014. Gemini 200 Models: one limited edition collectable, die-cast metal airliner model in a 1/200 scale of a Boeing B737-752/W in the AeroMexico Airlines current colors scheme. Airframe Registration EI-DRD. Model stand is included. This model is constructed of die-cast metal with some plastic parts. This product is available beginning in March 2018. Phoenix Models: one limited edition collectable, die-cast metal airliner model in a 1/400th scale of a Boeing B737-83N(W) in the AeroMexico Airlines Corona Logo Jet Colors Scheme. Airframe Registration N861AM. This model is constructed of die-cast metal with some plastic parts. This product is available beginning in November 2017. Gemini Jets Models: one limited edition collectible, die cast metal airliner model, in a 1/400th scale of a Boeing B737-8Max in the AeroMexico Airlines Current Delivery Colors Scheme. Airframe Registration XA-MAG. The model is constructed of metal with some plastic parts. This product was released in September, 2018. 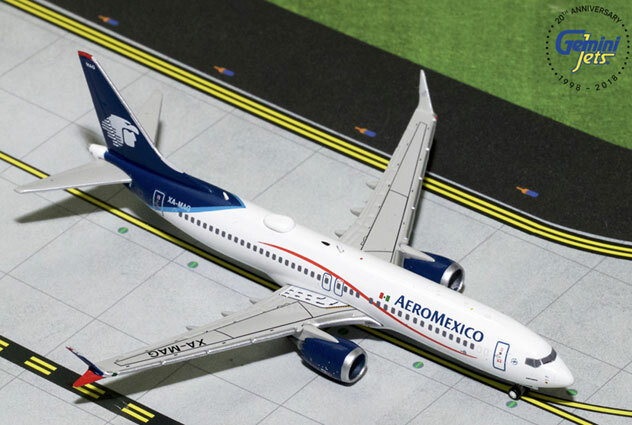 Latin Classics Models: one limited edition collectable, die-cast metal airliner model in a 1/400th scale of a NEW Mold Boeing B737-8Max in the AeroMexico Airlines NEW Delivery Colors Scheme. Airframe Registration XA-MAG. This model is constructed of die-cast metal with some plastic parts. This product is available beginning in May, 2018.